From the Hancock County Courthouse, go 0.9 mile southeast on Hwy 15. The cemetery is behind the church. Graves numbered 200 or higher passed away after our survey. 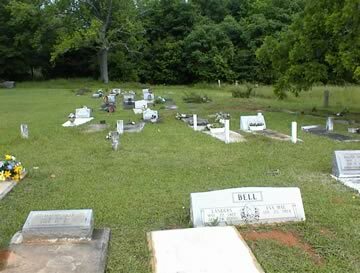 Their info is based on obituaries, and they are believed to be buried somewhere in the cemetery. PFC 4015 QM Trucking Co. Resting in peace with God. A philanthropist: Mother and friend who loved people and flowers. Resting in peace with God. He was an inspiration to all that knew him. Our Father Which Art in Heaven. Gravestone is blank. Our Father Which Art in Heaven. No years on gravestone. A loving, devoted mother and wife. Georgia PFC Co. A 1329 Eng. Age 42. All info from obituary. Age 72. All info from obituary. Age 30. All info from obituary. Age 91. All info from obituary. Age 16. All info from obituary. Age 87. All info from obituary. Age 95. All info from obituary. Age 75. All info from obituary. Age 82. All info from obituary. Age 44. All info from obituary. Age 31. All info from obituary. Age 58. All info from obituary.